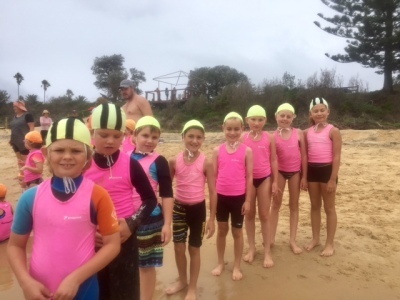 Nippers is open to all Bermagui SLSC club members aged between 6 and 13.
and develop skills in surf survival. For Nippers, the beach is the classroom. They gain confidence by participating in beach activities such as swimming, body surfing, board skills, beach sprints, flags and surf awareness. They also learn skills such as body boarding, dolphin-diving, spotting a rip and first aid. Activities are designed to introduce your child to the surf and build up their confidence so that they learn to enjoy and respect the sea. 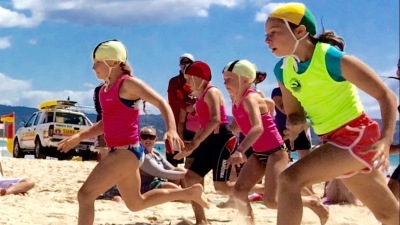 There are a series of carnivals throughout the season that Nippers can choose to compete in. The skills gained in Nippers will be carried for life! Next season's Nippers program will be similar to that for the 2017/18 season. Details will be provided shortly before next season begins. Nippers runs on Sundays and we typically have between 40 and 50 kids attend each week. We use a rotation system with a combination of water activity stations (including boards, swim and wade) and beach/land activities (including sprints/relays, flags, first aid). Each activity lasts for 20 minutes and groups rotate to the next activity when the siren sounds. We try to mix it up with some new activities each week. We're planning to have Friday Board Training this season . Board training is aimed at our younger members who are not all that confident yet on a board but all ages were welcome. Board Training runs for 1 hr from 4:30 pm -5:30 pm on Friday afternoons in the Bruce Steer Pool and we'll be posting a schedule once we have it confirmed. We're also planning Nippers Masterclasses to work with those kids interested in competing so watch here for dates and details. As always, we can't run a successful Nippers program without the help of parents and members. If everyone pitches in we'll be able to provide a fantastic experience for our young members. If you are able to lend a hand in any of the above areas please email bermisurfclub@gmail.com to let us know where you think you can help.